This is the 2nd time this little "taukeh" travel long distance since he was born. 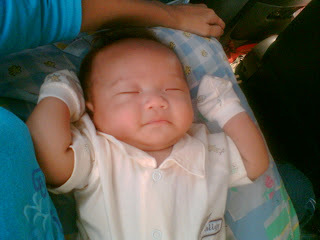 The 1st was travelling from KL to Kuala Trengganu.He slept all the way there. At that time he was just a week old. Was rather apprehensive this round to bring Joshua travel from KualaTrengganu back to KL. He is more active and tune-in to the environment. Luckily, Joshua was good. Cried a bit and then slept like a “taukeh". He must be thinking this is a new ”buaian” or something as he was lure to sleep in the car. However, Joshua might have a bit of motion sickness as he vomited out most of the milk milk he had during the journey. He started to cry when we got home as he sees it’s not the “home” that he was used to. Thank goodness maybe due to the long journey, he managed to sleep the whole night thru. Thus, this Small Kucing gets some rest at night.